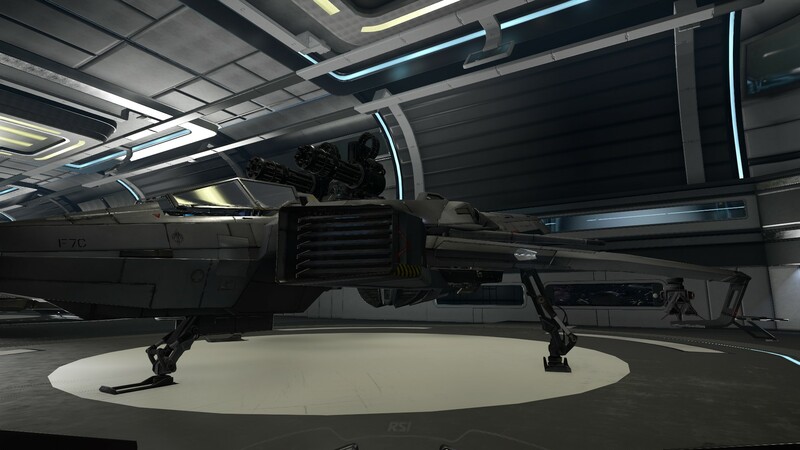 While there is definitely zero support for it, the ability to change weapons on the “trainer” ship that a player flies in Star Citizen’s Arena Commander is definitely an option. UPDATE: Here is the Star Citizen Ship Fitting Guide for Alpha 2.1. Changing weapons is fairly simple. I’ve thrown together a quick little video clipped from when I discovered it while playing. (Definitely a rough video, but it gets the point across.) View the video below. Approach the interface panel that is in the ship hangar to the rear left of the Arena Commander trainer ship. In my case, it is the F7A Hornet. Press “F” to interface with the interface. “F” is the default keymapping. Press “Tab” to activate the cursor to allow interaction. If a mouse cursor does not appear, take a step or two forward and try again. “Tab” is the default keymapping. Select the ship that you would like to modify. Drag it from the list on the right to the center of the interface. Select “WEAPONS” at the top and drag it to the left. Hold down the right mouse button on top of the ship and drag to rotate the ship until the desired weapon or weapon mount is in view to modify it. When done, close the interface by pressing “F” and enjoy the changes to your ship. Select the non-flyable ships first and remove their weapons. Weapons currently attached to other ships will not be available to the active ship! Some mounts are non-gimballed, which means they must be manually aimed with a proper lead on the target to score a hit. Keep this in mind, especially when mixing gimballed and non-gimballed weapons in the same weapons group! shaewyn: If you move/remove guns that need ammo they might not have ammo anymore, even if you put them back where they were. shaewyn: You need to reset your weapon groups every time you respawn. What non-default weapon combinations work for you? Have any tips or tricks for this system to suggest? Sound off in comments below!